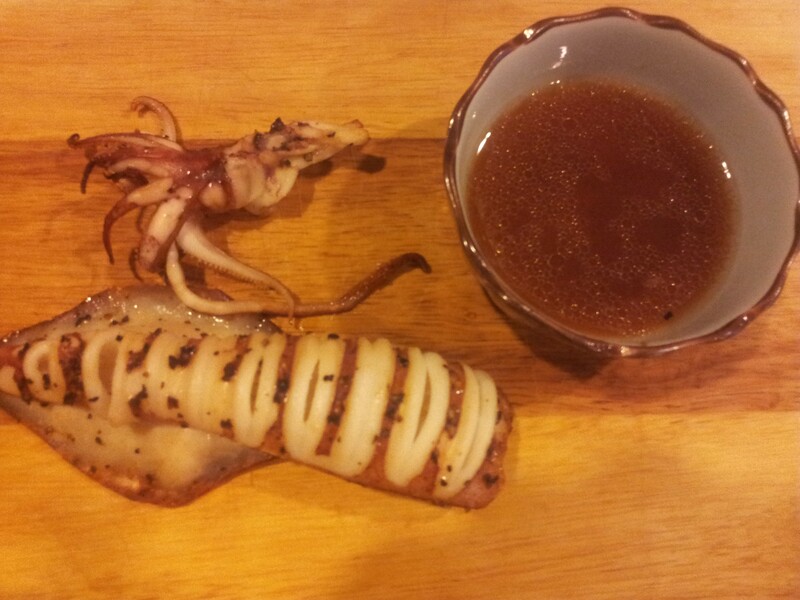 I always enjoyed ika sugatayaki (grilled whole squid) at Japanese Izakaya – 居酒屋 (though since I do not drink much I seldom visit Izakaya c/w very many other styles of Japanese food which I love). 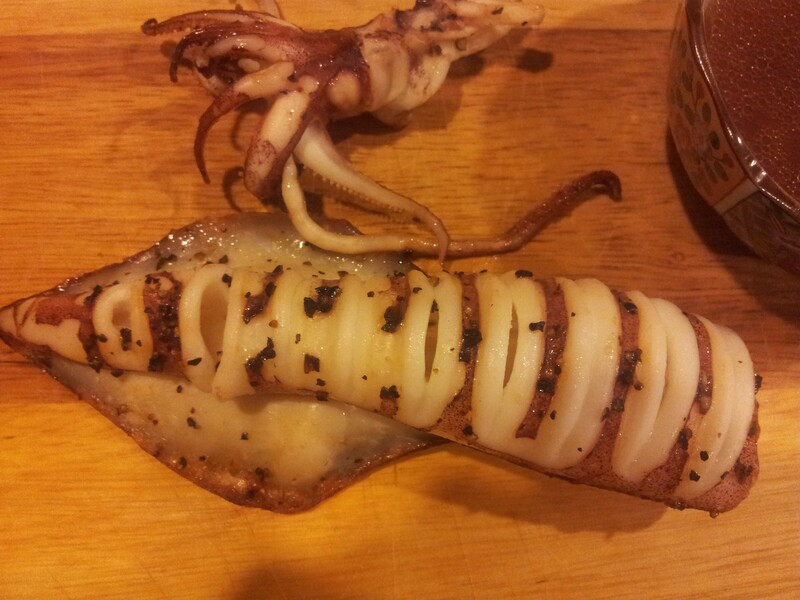 I was trying to find out how to do this as squid has lots of water & you end up steaming the squid instead of grilling. One way I can see is cutting the whole squid in 1/2 rings, then the water will be drained & the oven will grill & NOT just boil or bake the squid. I found a very nice Izakaya picture here. I also found a simple way of cutting the 1/2 rings. It is described here in Jamie Oliver’s recipe. You insert a knife flat into a large (250g) squid, then using another knife you cut the squid as if you are cutting it into rings. the knife stop at the surface flat of the inserted knife so you get your 1/2 rings. This way it is also easy to wash & remove the insides of the squid. I then line a baking tray with aluminium foil, place the dry squid & head (air-dry in fridge OR with kitchen towels) on it, sprinkle ground sea salt & coarse black pepper, & drizzle lime juice, olive oil & 1 teaspoon of light soy sauce. I place the baking tray in a preheated 210degC oven turned to the grill function for 10minutes, remove the squid and spooned out the sauce to a small bowl. I turn the squid over and return to the oven for another 8 minutes. Then I transfer to a serving board, and serve with the sauce as dip (as in the picture above).